Actress Emma Stone and 2013 Oscar host Seth MacFarlane present the 85th Academy Awards nominations for Best Picture on Thursday, Jan. 10, 2012 in Beverly Hills, Calif.
11. 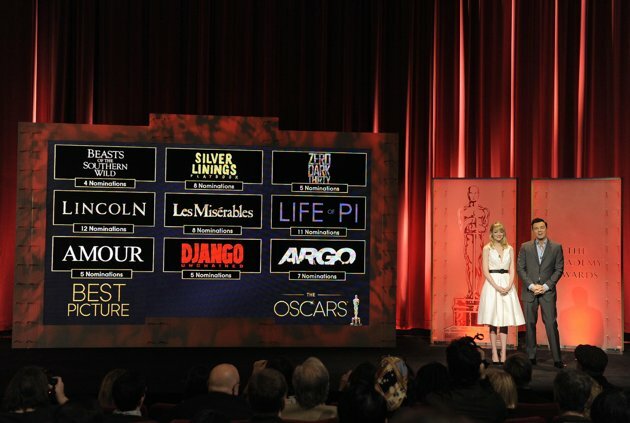 Production Design: "Anna Karenina," ''The Hobbit: An Unexpected Journey," ''Les Miserables," ''Life of Pi," ''Lincoln." 12. Cinematography: "Anna Karenina," ''Django Unchained," ''Life of Pi," ''Lincoln," ''Skyfall." 13. Sound Mixing: "Argo," ''Les Miserables," ''Life of Pi," ''Lincoln," ''Skyfall." 14. Sound Editing: "Argo," ''Django Unchained," ''Life of Pi," ''Skyfall," ''Zero Dark Thirty." 17. Costume: "Anna Karenina," ''Les Miserables," ''Lincoln," ''Mirror Mirror," ''Snow White and the Huntsman." 18. Documentary Feature: "5 Broken Cameras," ''The Gatekeepers," ''How to Survive a Plague," ''The Invisible War," ''Searching for Sugar Man." 19. Documentary (short subject): "Inocente," ''Kings Point," ''Mondays at Racine," ''Open Heart," ''Redemption." 20. Film Editing: "Argo," ''Life of Pi," ''Lincoln," ''Silver Linings Playbook," ''Zero Dark Thirty." 21. Makeup and Hairstyling: "Hitchcock," ''The Hobbit: An Unexpected Journey," ''Les Miserables." 22. Animated Short Film: "Adam and Dog," ''Fresh Guacamole," ''Head over Heels," ''Maggie Simpson in 'The Longest Daycare,'" "Paperman." 23. Live Action Short Film: "Asad," ''Buzkashi Boys," ''Curfew," ''Death of a Shadow (Dood van een Schaduw)," ''Henry." 24. Visual Effects: "The Hobbit: An Unexpected Journey," ''Life of Pi," ''Marvel's The Avengers," ''Prometheus," ''Snow White and the Huntsman."